Tablao Flamenco Cordobes stages exquisite shows that top the entertainment charts. The shows are laudable and the service is efficient. They serve delicious food at the venue too. The performers know their job and perform flawlessly. Tablao Flamenco Cordobes makes for an exceptionally eventful evening especially for those who respect talent. Take some time off and enjoy a stupendous performance with family and friends when in the city of Barcelona. Visit the official website for price details. Visit the official website for show timings. How popular is Tablao Flamenco Cordobes? People normally also visit Torre Agbar while planning their trip to Tablao Flamenco Cordobes. it was a great experience to see Flamenco in Spain! the Buffet style dinner was also delicious. you can see many different dishes from all over Spain. Staff are very helpful and What I most love was taking photo and send it to my email address as FREE!! I had never seen the free photo service in tourist places. the dancers are so passionate about Flamenco dance. I really enjoyed the time there. Thank you very much!! I won't lie; the buffet dinner had my wife thinking that we had made a tourist-y mistake. I was actually pleasantly surprised by the quality of the food, which was generally tasty. They were very generous with the drinks and we went into the performance hopeful. We were blown away for the next hour. The flamenco performance was incredible; every performer was clearly a lifelong artist and the setting was intimate. The sound was all acoustic and clear. The performance venue was well designed and there wasn't a bad seat in the house. Both of us were totally thrilled. We both came away with an experience we will never forget. Overall, the show made up for everything else; we came way feeling that it was well worth the money and the somewhat mass-produced (but tasty!) meal. We had an excellent evening at Tablao Flamenco Cordobes. We booked the pre-show dinner, and what a lovely spread. Good selection of food and plenty to drink. The staff were lovely and they even managed to surprise my husband with a birthday cake. The show was marvellous, the dancers were full of passion. If you want a HOT night, book this venue, you will not be disappointed. Most appreciated flamenco restaurant in Barcelona. Make sure to book your tickets well in advance as it’s very busy. We’ve encountered Chinesse people at the entrance nearly crying for our tickets and offering us ten times the price. Lovely exotic menu too, also included in your ticket. A night to remember. 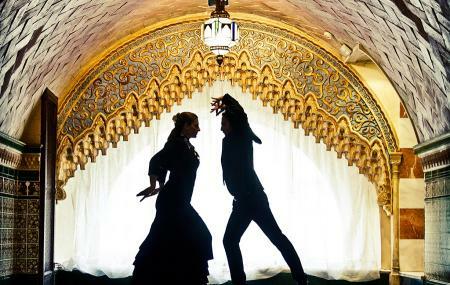 spectacular flamenco experience w/ extraordinary tablao performers... captivating dancers, musicians & singers...wow... wonderful food w/ exceptional service... don’t miss this...highly recommend! !